The Oakland Raiders have been ranked as PFF’s 14th best secondary heading into the 2017 season. The Raiders are rebuilding their defensive backfield with youth having drafted cornerback Gareon Conley and safety Karl Joseph in the first round the last two years. Joseph was PFF’s 50th ranked safety in his rookie season of 2016 with an overall grade of 75.5. His coverage grade of 79.6 was 29th best among safeties. 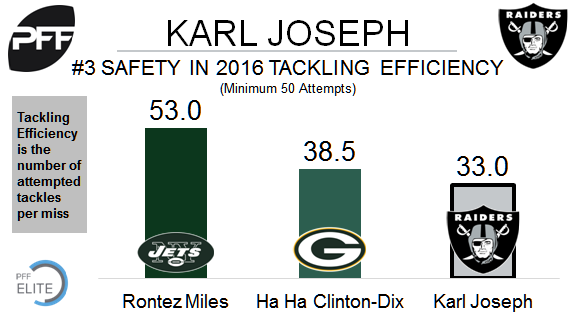 Tackling was Joseph’s strength last year as he only missed 2 tackles in 66 attempts. His combined tackling efficiency of 33.0 (attempted tackles per miss) was third best among safeties with at least 50 attempts.